Tasked to defend the colony from attackers, the specialised soldier caste in some termite species has evolved various impressive mechanisms, including plug-like heads—meant to block intruding ants trying to invade their lairs, and mouthparts designed to bite and pierce. 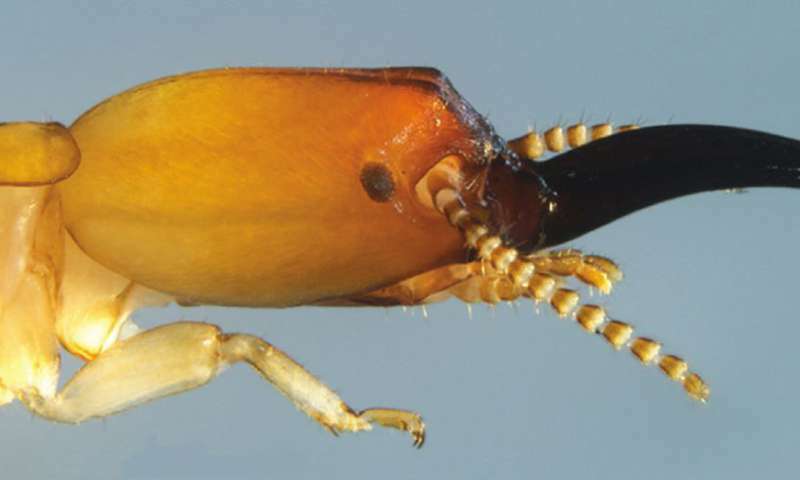 Still, there are even more spectacular soldiers, such as a recently discovered drywood termite species, whose unique long and slender, stick-like snapping mandibles produce one of the highest acceleration speeds measured in a living organism. Rather than bite, these peculiar 'jaws' deliver powerful strikes at enemies bold enough to stand in the way of the soldier termite and its colony. "Roisinitermes employs a unique strategy of snapping, achieved by long and slender mandibles pressed against each other in a defensive encounter. When this potential energy is released, the left mandible springs over the right and the resultant snap is forced onto the opponent if it is in the path of the strike." Discovered in Cameroon, this striking species is the first drywood termite found to rely on snapping mandibles as a defense strategy. Given that until now there had been a single subfamily (Termitinae) known to have developed such, the very existence of the new insect poses a whole new set of questions before scientists. Have snapping mandibles evolved independently in two evolutionary lineages? Or, is it that these groups share a distant kin relationship which has gone unnoticed for that long? 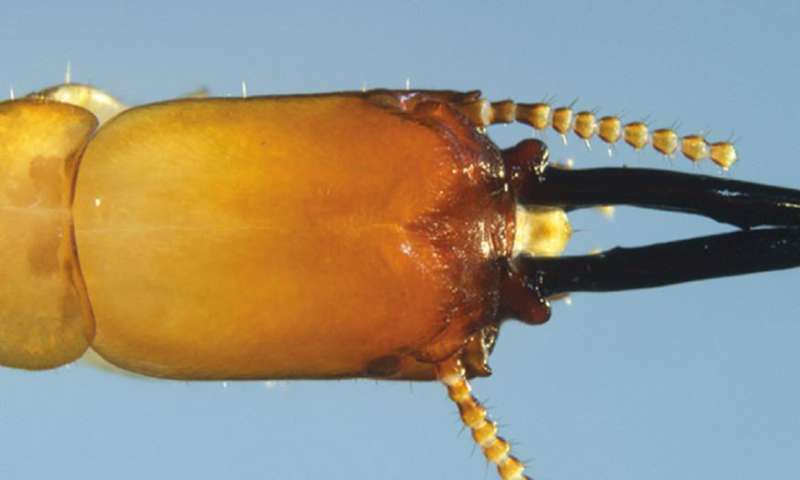 The new drywood termite, which is also assigned to a new genus, is named Roisinitermes ebogoensis, and is described in the open access journal ZooKeys by an international team of researchers, led by Dr. Rudolf Scheffrahn of the Institute for Food and Agricultural Sciences at University of Florida, Davie, USA. Although this particular species is not thought to be a pest, some drywood termites cause serious damage to wooden structures around the world. Both colonies studied by the scientists were found near the Ebogo II village, which also stands behind the name of the species. The first unusual colony to draw the attention of the scientists was collected from a forest on an island in the Nyong River, where it lived in a thin (3 cm) and long (over 3 m) broad-leaf tree branch suspended from a canopy. The second one—in a 15-mm thick dead liana branch hanging from a tree in a nearly pristine rainforest. The team expects that future research will shed more light on the origins and evolution of the newly discovered termite.